Blood oranges have red flesh inside and a reddish tinge to their rind on the outside, making them a different type of orange than the common Valencias and navels. The blood oranges have a tart, raspberry-like taste. Several varieties of blood oranges exist: commonly found in nurseries are the moro, ruby and tarocco blood oranges. All blood orange trees are frost-tender, so if you live in USDA climate zone 8 or lower, pot your blood orange tree in a large pot and move it indoors before fall brings your first frost. Dig a planting hole twice the size of your blood orange’s root system. Spring is the best time to plant in climate zones 9 and 10. If you live in a colder climate zone, grow your blood orange tree in a large container, which you can move indoors in the winter. If your soil is rich and contains organic material such as decomposed leaves and humus, you need not add compost. If your soil is clay or sandy, mix one two-gallon bucket full of organic compost of any type with the soil you dug out. If the soil you removed from your planting hole fills two five-gallon buckets, two gallons of compost is the correct amount. Return about half of your soil/compost mixture to your planting hole and then set your potted blood orange tree into the hole to determine whether you need to add more soil/compost or whether you need to remove some. It’s important not to bury the base of the tree’s trunk, especially if it has been grafted. Leave the graft above the top of the soil. Remove your blood orange tree from its nursery pot and loosen the roots slightly, especially if it appears to be rootbound. Then set your unpotted tree into the planting hole and fill in with the additional soil/compost mixture you removed. Tamp the soil down lightly by stepping on it. Water your blood orange tree every three to four days for two weeks after you plant it. After it begins to show signs of new growth, water it once a week to 10 days. Fertilize your blood orange tree with a commercial plant food designed for citrus trees three to four times a year, according to package instructions. Blood oranges also respond well to bimonthly applications of fish emulsion and by having a layer of compost spread around their drip line, in a doughnut-shaped configuration at least 2 feet from the trunk. Do not plant your blood orange tree in a basin because this citrus needs good drainage---if it sits in a puddle of water, it can develop root rot and eventually die. Barbara Fahs lives on Hawaii island, where she has created Hi'iaka's Healing Herb Garden. Fahs wrote "Super Simple Guide to Creating Hawaiian Gardens" and has been a professional writer since 1984. She contributes to "Big Island Weekly," "Ke Ola" magazine and various websites. She earned her Bachelor of Arts at University of California, Santa Barbara and her Master of Arts from San Jose State University. 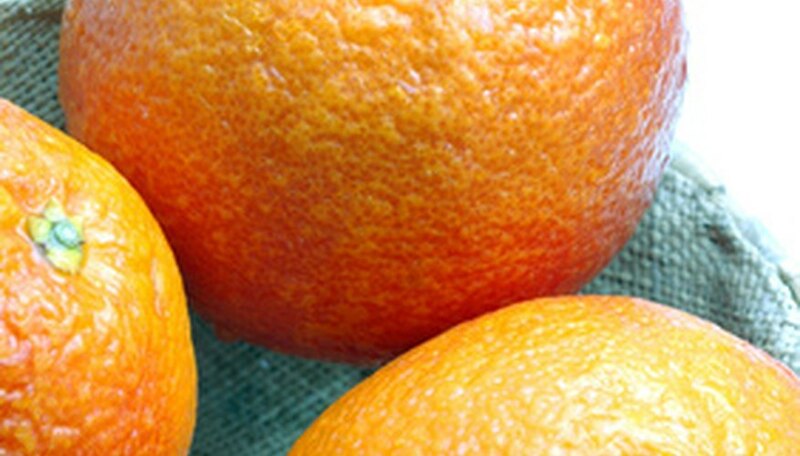 What Is the Difference Between a Navel Orange Tree & a Dwarf Navel Orange Tree?